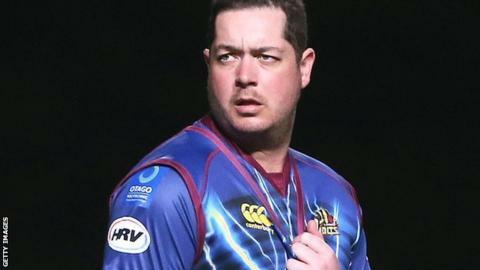 "I keep everyone on their toes," says Jesse Ryder. Bowlers, scorers, cover fielders, captains, coaches, cricket writers, club bouncers, gossip columnists, toxicologists, neurologists… Know anyone with toes? Then add them to the list. It was only a few months ago Ryder wondered if he'd ever have much use for his own toes again. The New Zealand batsman was trussed up in a Christchurch hospital, tubes emanating from every orifice: sore head, memory shot, no clue why. "The first thing I remember was seeing everyone standing around my bed," says Ryder, who was bashed into a 56-hour coma outside a Christchurch bar in March. "It was a bit of a surprise to be honest. The first thing I thought was: 'I've got to catch my flight to India for the IPL.'" The Delhi Daredevils had to do without him because Ryder never made that flight. The big man with the big bat had more pressing things on his brain, quite literally, in the case of a busted skull. There was also a damaged lung. And he had to learn how to walk again. "It didn't look good," says the 29-year-old. Back at home in Wellington, a trip to the bathroom was akin to scaling the foothills of Everest. "My balance was well off," he says. "I'd get light-headed, I couldn't catch my breath. When you're struggling to get off the couch, holding onto stuff just to get to the toilet, you think: 'How long is this going to last?'" "How long is this going to last?" It is a question often asked of Ryder, when his head is right and he is making runs. It usually doesn't last long - perhaps because when he is making runs, it doesn't necessarily follow that his head is right. Ryder, one of the most muscular hitters in world cricket, was making runs again last week, scoring 117 for new side Otago in his first match since the attack. He would have been back sooner but for a pesky six-month drug suspension. "About two weeks after I came out of hospital I got a phone call saying I'd failed a drugs test," says Ryder. "I was a bit shocked." Nobody else was. Ryder, who former Black Caps wicket-keeper Adam Parore once said was "too fat" to play for New Zealand, had taken a dietary pill. At his tribunal it was revealed that he referred the supplement to medical staff, that it was cleared but that his batch was contaminated. Don't call trouble, Jesse, trouble will call you. "There will always be people waiting for something to happen," says Ryder. "But I'm not too fussed about the haters. I'm not going to hide under a rock, staying at home by myself all the time. You've still got to live your life and have fun with your mates. I've just got to be more careful." There will always be people waiting for something to happen because something always happens. In 2007, Ryder was sacked by Ireland after failing to turn up for a game. In 2008, he racked up 196 runs at an average of 49 in his debut series against England. Days later, he severed a tendon in his right arm having punched a window while out drinking. Glaziers - they also have toes. Ryder bludgeoned his way back into the team, scored big runs in the Test series against India in New Zealand in 2009 and impressed again on the sub-continent in 2010. His batting in the shorter forms of the game can be magnificent, evidence of which was his maiden one-day international ton against the Indians at Christchurch. But despite his abundant natural talent, and New Zealand's relatively small pool of players, Ryder has played only 18 Tests and 39 one-day internationals. Because something always happens. There were fines for hitting things with his bat other than cricket balls, missed team meetings, rows with managers, more injuries. Then, in February 2012, Ryder was dropped after another drinking session and promptly quit cricket for eight months, citing "personal problems". In his first two innings back, he scored 117 and 174 for old side Wellington. When Ryder talks about the "tough road back" from his latest "something always happening" it should be remembered he has trodden many tough roads. Abandoned by his parents at the age of 14 - Ryder says his father dropped him off at a mate's house before leaving for Australia - the unloved and unfettered kid fell into a dissolute life in Napier, drinking and partying to excess. Cricket gave him direction, but it also gave him more opportunities to drink and party. Since his teenage years, cricket and drink have been the twin themes of Ryder's life - seemingly synonymous, inseparable. But having moved down to Dunedin from the capital, Ryder senses a new beginning. "It's got to the stage now where I've been through the worst of it," says Ryder. "There's not much more people can do to knock me down. But I've got a new drive, what with wanting to get back in the Black Caps team. "Instead of just going along for the ride, like I did in my younger years, I've got more ambition now. But I'm a lot more chilled out. Not too much fazes me now. I don't get upset if I don't get runs or upset about little things like I used to. "And since the move I've got good processes in place and it's working for me. I've shredded a lot of weight and I've been enjoying my cricket. That's the key." It would be easy to scoff when Ryder tells you this is his "second chance". Fat chance, many would say. But being kicked to within a few inches of your life is likely to reboot your mind and provide you with a whole new perspective. "I'm not 100%," says Ryder. "I still get light-headed and forget things. But I'm lucky I came out on the right side. "The other day I read about a guy who got attacked and didn't make it. That could have been me."